Discover historic Paris and the famous gothic cathedral of Notre Dame de Paris! The historic heart of Paris is probably the most fascinating and the most romantic part of the entire capital and on this tour, you will have the opportunity to visit it with a tourist guide who will enrich your experience with interesting details and stories. The tour also includes a visit to two of the most characteristic neighbourhoods, the Latin Quarter and Le Marais, on board a comfortable, air conditioned bus. Select this tour of Notre Dame and let yourself be entranced by the discovery of historic Paris and one of the most famous gothic cathedrals in the world. The tour starts with a guided visit to some of the oldest neighbourhoods in Paris, on board a comfortable bus. You will have the opportunity to admire some of the most important squares and avenues such as the Place Vendôme and Place de la Bastille, Rue Saint-Antoine and Saint-Germain des Prés; monuments of great importance historically that are equally memorable for their beauty such as the Louvre, the Hôtel de Ville, the University of the Sorbonne and the Pantheon. In other words, you will have the chance to see some of the most typical and historic areas of the French capital, accompanied by a guide who will surprise you with intimate details of what you are seeing so that your voyage of discovery around the city is truly enriched. On beautiful days, (that means - when the weather permits), the tour is continued with a short trip by boat on the River Seine in order to reach the small island of Île de la Cité. In this enchanting spot, first of all your guide will tell you about the intricate history of Notre Dame's facade before going inside where you can stand back in amazement at the beauty of the colours in the stained glass windows. The major plus point of this tour is in the combination of an expert guide who speaks your language and a driver who knows the city like the back of his hand. 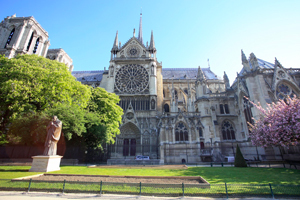 In fact, the tour of Notre Dame combines a practical tourist route on a comfortable bus with the presence of an experienced tourist guide who will be able to tell you small details and curiosities about some of the monuments, squares, most important streets and historic neighbourhoods of Paris. This tour is ideal for those who have limited time, who are visiting the city for the first time and for those who love to know the intimate details about a place they are visiting but at the same time, don't fancy continuallly having to change their mode of transport or having to wait around at the bus and metro stops. Tour in English: Available every day.